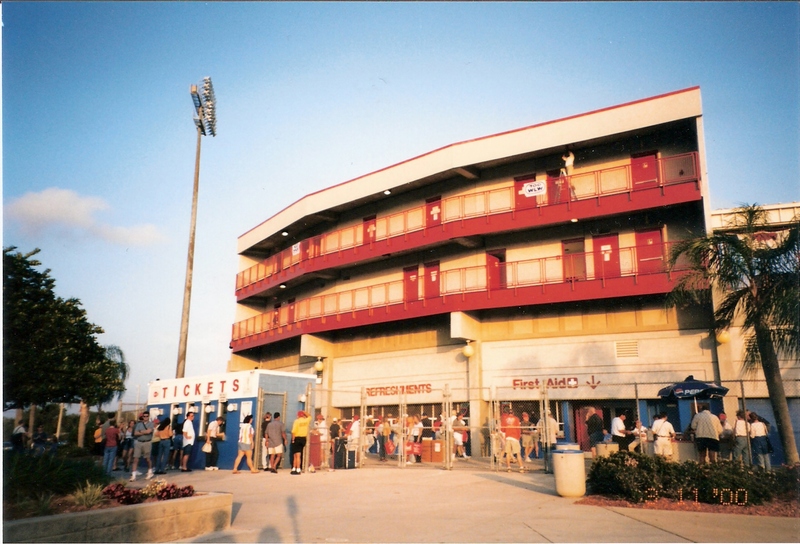 Unless it’s been refurbished in the past 10 years, this is what the exterior of the part behind home plate looks like. All those railings and doors look just like a motel to me. After yet another mouth-watering breakfast at the Inn at the Bay, we made our way to Bright House Field for today’s Phillies-Tigers game. If I haven’t already mentioned it, the Inn at the Bay serves the most awesome breakfasts. We’ve stayed there five times, and we’ve almost never had the same breakfast twice. They are so filling, most days we don’t even need lunch! During a pitching change, Johnny Damon, Adam Everett, and Brandon Inge discuss the fly ball that got lost in the sun and just dropped into the Bermuda Triangle of turf between all three of them for a hit. They all appear to have sunglasses – guys, weren’t you using them? St. Patrick’s Day dawned rather gray and dreary. On our way to the ballpark, it even rained a little bit. This had me concerned, because our “seats” for today were on the berm, the grassy area beyond the outfield fence. I wasn’t looking forward to sitting on soggy sod. Not to fear though. By gametime, the skies had cleared and it turned into a sunny, pleasant afternoon for our final day in Florida. Mark Texiera and Alex Rodriguez wait their turns in the batting cage. Just what is that huge wad hiding in A-Rod’s cheek? Gum? Sunflower seeds? Some chew? His ego? Just before the game started, I met up with Confession of a She-Fan‘s Jane Heller and got interviewed by her on the She-Fan Cam. Click here to read Jane’s coverage of the game, and see the video clip. The last time my husband and I came to Spring Training, in 2007, we saw the Phillies host the Yankees on St. Patrick’s Day, and Andy Pettitte started for the Yankees. Three years later, we are seeing the Phillies host the Yankees on St. Patrick’s Day, and Andy Pettitte is starting for the Yankees. Deja vu! Later that evening, we met up for dinner with Jane and her husband Michael, as it turned out that they were staying just three blocks away from us in St. Petersburg. We all enjoyed a delicious meal, and great conversation. The time flew by, and since we all had flights home the next day, finally had to bid each other good night. Our flight home was much better than the first – no turbulence, and my husband and I actually got to sit next to each other this time. Revealed! Origin of Lasorda/Phanatic Feud! An unnamed source has recently provided the background information leading up to this heinous act. Recall that prior to the Dodgers’ move to Los Angeles, they were based in Brooklyn. she had, during her rebellious younger days, taken a “girls only” trip from her home in the Galapagos Islands to, of all places, Brooklyn. While there, she and her friends met the young Lasorda. Phoebe and Tommy hit it off, and, well, things happened. Since the gestational period of the phanaticus species lasts several years, Lasorda and the Dodgers had already moved to California by the time Phoebe gave up the illegitimate child for adoption. After this, Phoebe settled down, and many years later, the Phanatic was born. Phoebe was able to keep her secret for awhile, but eventually the Phanatic learned the truth. When he did, he was so mad he turned completely red! but thankfully the charges were dropped. Mr. Met! The Phanatic’s least favorite mascot! Tommy, or should I say Mr. Lasorda, in the infinitesimally small chance that you are actually reading this, please look at the calendar before you get your knickers in a twist! Ahh, the hot dog, linked with baseball for what seems like, well, forever. If not forever, then at least 100 years or so, though the actual date of the momentous marriage of American favorites is not exactly known. Hot dogs are also referred to as frankfurters, franks, wieners, or wienies, though I personally can’t use the last two and keep a straight face, due to my son’s use of those terms to mean something else entirely. According to the National Hot Dog and Sausage Council, the hot dogs consumed at MLB ballparks during the 2008 season would round the bases 41,667 times – enough to stretch from Nationals Park in Washington, D.C. to AT&T Park in San Francisco! That’s a lot of dogs! Babe Ruth supposedly liked hot dogs – a lot. Legend has it that the Babe gorged himself on 12 to 18 hot dogs before collapsing on a train ride in April 1925. A week later he underwent surgery for an intestinal abscess. This dried-up, partially consumed hot dog on display at the Baseball Reliquary was supposedly part of that binge. What I’d like to know is why someone saved this? Eww! And where has it been for the all the intervening years? Somebody’s attic must have really reeked! In all likelihood, the vast majority of hot dogs consumed at baseball games are purchased at concession stands, or from the vendor if you don’t want to get out of your seat. But why have your hot dog just handed to you, when it can come flying through the air instead! I’ve circled the errant hot dog. Presumably some “lucky” fan only got a bun. The Crazy Hot Dog Vendor is actually pretty popular – so much so that he even had his own bobble head given away at a game. The main problem tends to be that frequently, bits of hot dog, bun, and wrapper rain down on the fans in the rows in between the launcher and the intended target. Oh well, I guess the old-fashioned way is best after all. So no matter how your hot dog is delivered to you this season, enjoy! And don’t think too much about what’s actually in it. As promised, here are the answers to yesterday’s quiz. 1) Simon and Garfunkel. The line is from the song “Mrs. Robinson”, featured in the movie “The Graduate”. 2) Centerfield, from the song of the same name. 3) Bruce Springsteen, from the song “Glory Days”. 4) Phil “The Scooter” Rizzuto, in the song “Paradise by the Dashboard Light”. 5) Manny Ramirez. The song is called “Moonshot Manny”. b) Black Train Jack, on the album “No Reward”. I saw this CD and was tempted to buy it simply because I really like that photo, and I was intrigued by their use of it. But I didn’t. So I have no idea what their music even sounds like.